One of the great benefits of being a part of the Chewy.com Blogger Outreach Program is getting to try out different foods that your Mommy might not buy if she saw it at the store. I know that's the case at my house because she figures why spend money on something I'm probably not going to like anyways MOL!!! 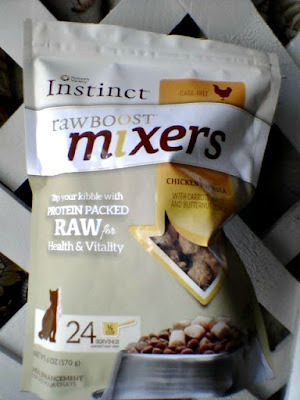 This month we chose the Nature's Variety Instinct Raw Boost Mixers more or less as an experiment because she wanted to see how I felt about freeze-dried raw, knowing that if I liked it she would have a healthy addition to the kibble I love so much. Formulated to mirror your cat’s ideal ancestral diet, Instinct Raw Boost Mixers make it easy to add protein-packed raw to your pet’s kibble for health and vitality. Enhancing your cat's meal with all natural, grain-free, freeze dried Instinct Raw Boost provides pure animal protein for lean muscles and strong bones, natural ingredients for optimal nutrient absorption, and nutritious oils for healthy skin and coat – all in a convenient, safe and delicious form your cat will love. So when the package arrived Mommy immediately added it to my bowl of kibble and I dug right in. You guessed it...I ate around the raw pieces. Mommy was pretty disappointed because she was really hoping that I'd like it. 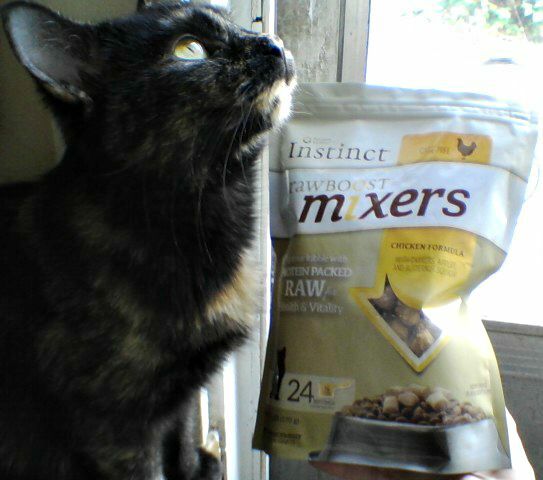 Then yesterday she read two great blog posts by our friends at Glogirly and Sparkle Cat about how amazing Nature's Variety Instinct Raw is and she's decided to keep trying to introduce it into my diet. We received a free bag of Raw Boost Mixers in exchange for our fair and honest review as part of the Chewy.com Blogger Outreach Program. All opinions are our own. We received some of these and we ate every piece and left the kibble. We'll post about it next week. I tried the kind for dogs and they loved it! But my kids will pretty much eat anything! I wonder if my cats would like these. They are pretty picky. Looks yummy...we've heard good things about this food!!! Keep trying, Melissa - I bet eventually, Miss Mudpie will decide that raw food is real food, and she'll turn her back on everything else. It took Ashton a while to figure out that raw was real food, and it took trying more than one kind of raw before the little light bulb came on over her head. Now she eats raw just like she does potato chips. We're sure Mudpie will too... minus the potato chips, of course! We've tried this and really liked it. One thing your mom may want to try is break up the pieces and mix it into your food better. Or if she adds it to wet food, add some water to soften it up. We hope you learn to like it. You are too funny Miss Mudpie :) Good to keep Mommy trying to please you. new textures can be hard to get used to, but change can happen. That sounds really great! We are not big on changing our foods either Mudpie! Dar's okay Mudpie. Ifin at furst yous not succeed then twy and twy again. Mommy had to cut ours into smaller bites. And we also like 'em wiff sum warm water to wehydwate them. good luck we look furward to seein' da wesults. When TW first gave me the Natural Balance kibble mixed with freeze dried raw, I ate around them too. Now I eat them near the beginning. They’re actually quite tasty, MP.